This short wave infra-red heater has been developed to meet the requirements of today’s needs for outdoor heating. The heater is weatherproof and is suitable to be used outdoors in any application; it is perfectly safe to be used in the rain and continues to work even when subject to intense water jets. Using a quartz lamp especially tuned to give a warm colour of light it also delivers high energy instant heat. HLQ pro models are designed for general internal installation or under waterproof canopies / roofs, providing quartz short wave high-energy instant infrared heat. With models from 3KW to 6KW they offer the instant answer to many zone or localised heating solutions. 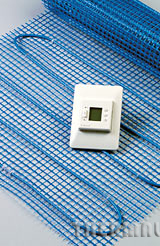 The units can be wall mounted or ceiling suspended, and come in single and three phase versions. 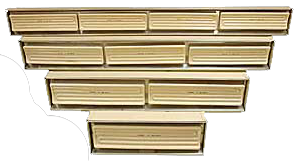 They are manufactured from aluminium, and are finished in a neutral ivory powder coat finish. Guards come as standard with all models. All heaters are fitted with high efficiency gold shortwave lamps as standard. 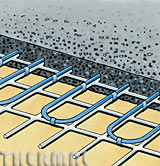 In-slab h eating uses heating cables embedded in a concrete slab floor to provide home heating. 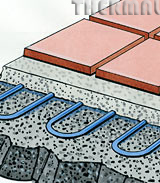 The slab stores the heat at night and releases it to provide continuous warmth to the home during the day. It also takes advantage of off-peak heating rates – and can be used in combination with other systems or as stand-alone heating using some day-rate energy. In-slab heating is generally used in new constructions but can also be used on top of an existing slab – providing there is a sufficient top cover of new cement of at least 25mm. The PUBSUN is a safe and simple inside & outside heating system that allows you to provide warmth and comfort simply and effectively. The PUBSUN ceramic infra-red technology is environmentally friendly, easy to install, safe and convenient. The heaters warm up in minutes and do not require regular servicing. Our radiant heaters are constructed from a strong heavy duty aluminium frame, stainless steel reflector, reliable tubular sheathed elements and high temperature wiring and terminal connections. They can be cable mounted on walls using optional mounting hinges, or from the ceiling either flush mounted or suspended by a chain, to allow heat to be directed exactly where it is required. The radiant heaters incorporate 1mm diameter alloy sheathed elements. Single ended connection to ceramic terminal blocks is incorporated in all models. All units are suitable for fixed wiring.